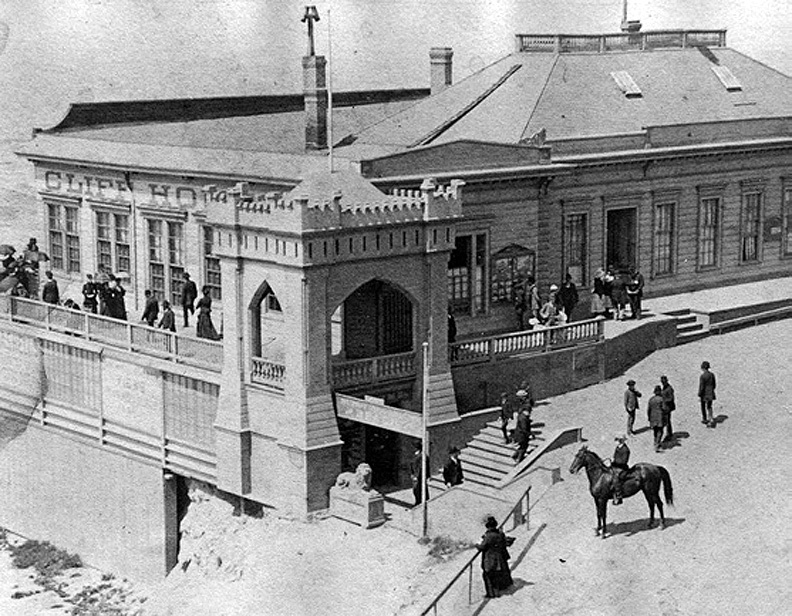 First Cliff House, circa 1865. A never-ending argument among local historians and San Francisco history buffs concerns the number of Cliff Houses that have stood overlooking Seal Rocks. Some say three, others five, some as many as six. It all comes down to how one defines a structure, and at what point does it change so completely that it becomes a totally different building. 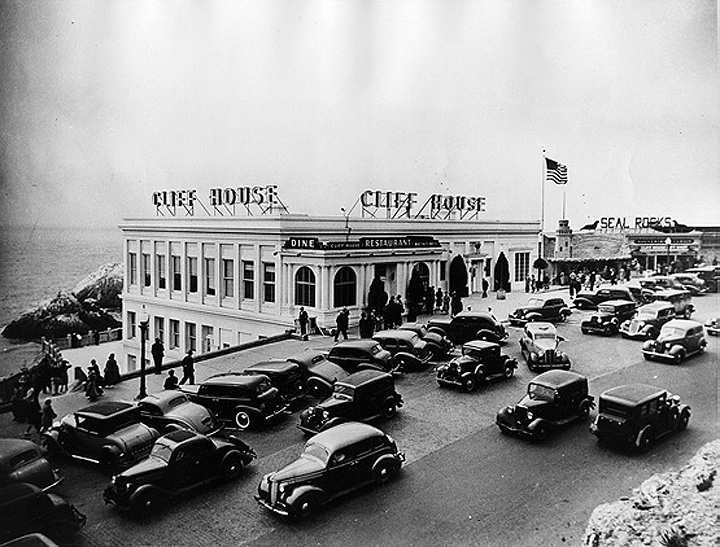 The history of the Cliff House is pretty straightforward, and quite melodramatic. Originally built in 1863, it was enlarged in 1868, blown up in 1887, burned down in 1894, rebuilt in 1896, burned again in 1907, and rebuilt one more time in 1908. Seems straight­forward enough, but not included in this brief time line are the numerous remodelings the buildings underwent during their precipitous years hanging off the cliff face. Here’s a slightly expanded version of the points listed above, along with a little historical context. 1858: A roadhouse calling itself Seal Rock House opens at the north end of Ocean Beach, snuggled against the bluffs of the future Sutro Heights, but nearly a quarter mile from Seal Rocks. It would change names often over the years, sometimes being called Long Branch House, Long Branch Hotel, then Seal Rock Hotel. However, no matter the name, it was not the site of the future Cliff House. 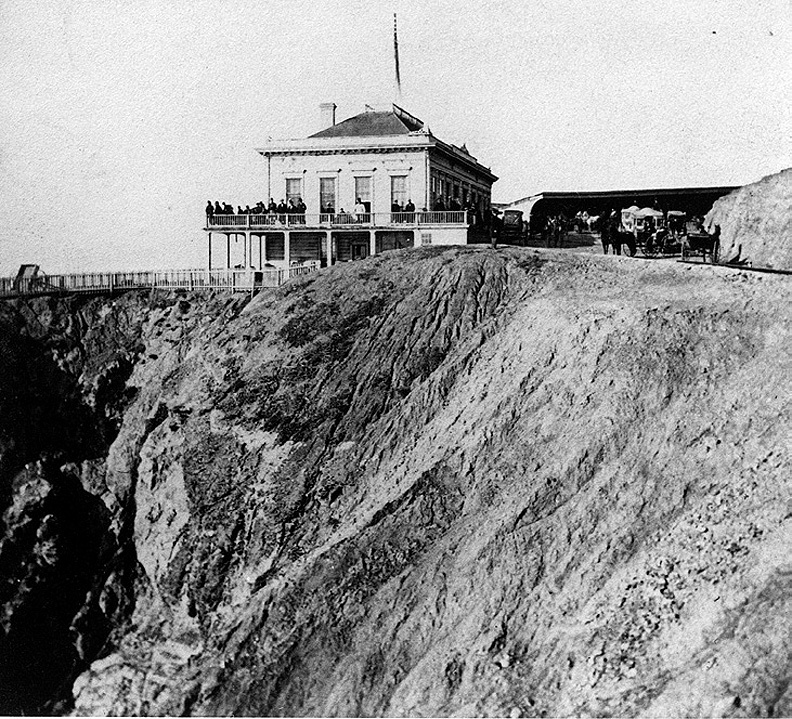 1868: During the 1868 remodeling, the Cliff House owners enlarged it to approximately four times its original size, adding two wings that enveloped the original rectangular structure, and leaving only a portion of the original facade on Cliff Road exposed. These were odd additions. The north wing was a sort of a “mini-me” version of the original Cliff House, complete with scaled down footprint, hipped roof and widow’s walk. The other, larger addition was an L-shaped wing surrounding the entire west and south sides of the building. 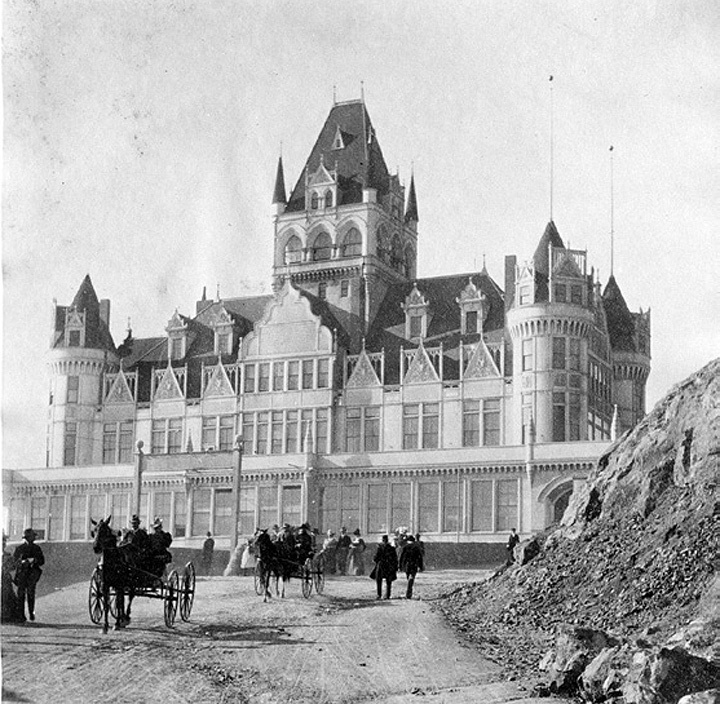 Its architectural style was totally different from the original 1863 Cliff House and the north wing. Instead, the L-shaped wing had a flat roof with a raised parapet. Its larger size permitted greatly expanded viewing verandas. 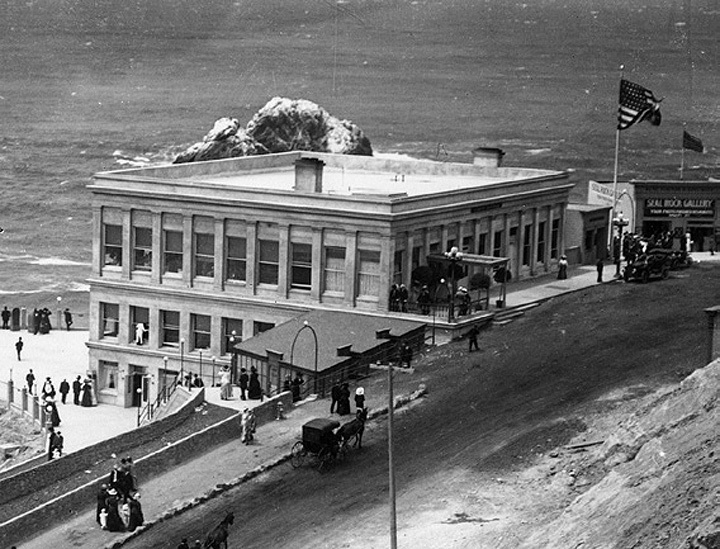 Circa 1883: Adolph Sutro purchased the then-seedy Cliff House in 1883 and installed a new manager to clean up the roadhouse. About this time, a minuscule castle-like addition appears at the southeast corner of the structure. It’s assumed Sutro ordered this addition built, but documentation is elusive. With its crenelated parapet and pointed-arch openings, the little addition had a distinctly European feel to it—some have said Norman. 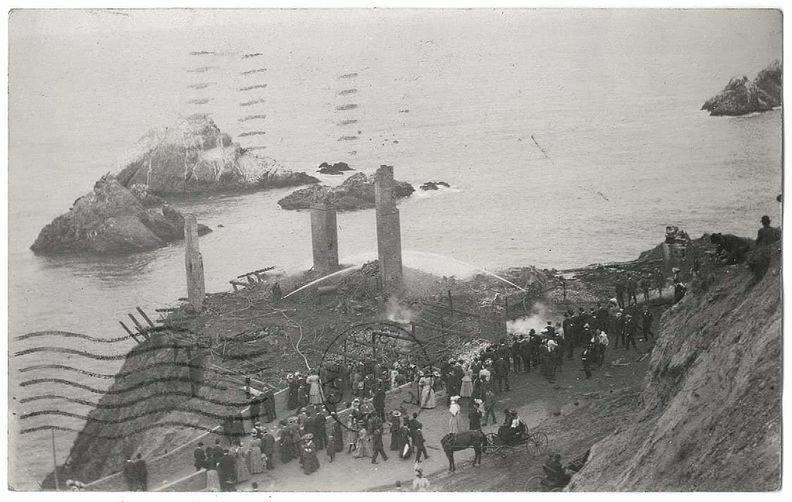 It also eerily presaged the much more grandiose “Victorian” Cliff House that Sutro would build in the 1890s. Smoldering ruins of Cliff House, 1894. 1896: Called the “gingerbread” or “Victorian” Cliff House, Sutro’s elaborate structure was the shortest-lived of all the Cliff House buildings. Opening February 1, 1896, the wood frame building remained essentially unchanged during its eleven year existence. 1936-1937: The Whitney Brothers, owners of nearby Playland at the Beach, purchased the Cliff House from the Sutro Estate in late 1936 and upgraded and remodeled it as an “upscale roadhouse.” The most notable exterior change was the addition of large illuminated letters spelling out CLIFF HOUSE on two sides, facing towards Point Lobos Avenue and Ocean Beach. 1950: This is the Cliff House most of us Baby Boomers remember, with its towering (false) chimney, “moderne” detailing, and cozy bar with big windows looking at the ocean and Seal Rocks. The original 1909 building commissioned by Emma Merritt was still there, but buried under the siding, leaving only the west wall exposed. In fact, unless you walked onto the terrace to see the surviving wall, you likely would have thought this was an entirely new building. 2004: Today’s Cliff House isn’t a restoration of Emma Merritt’s, but rather a rehabilitation of that structure. It also includes a new wing to the north of the historic structure called the Sutro Room, which made up in square footage the demolished third story. During the project, many exterior details of the original Cliff House were restored, though, including long-lost cornices, dentils, and window openings. Also, a slightly smaller version of the illuminated 1930s CLIFF HOUSE sign was placed on the building facing Point Lobos Avenue. So, how many Cliff Houses? 1858: Seal Rock House constructed. Doesn’t really count. 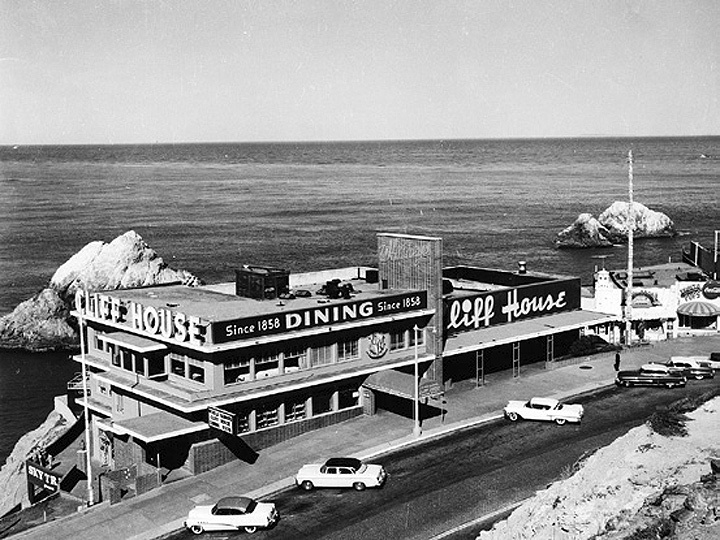 Despite the Whitneys’ prominently-displayed neon sign claiming “Since 1858,” the Seal Rock House wasn’t a Cliff House. 1863: Cliff House #1 built. 1868: Cliff House #1 expanded with two large additions. 1883c: Cliff House #1 modified with Sutro’s mini-castle. 1896: Cliff House #2 built. 1909: Cliff House #3 built. 1937: Cliff House #3 upgraded by Whitney Brothers. 1950: Cliff House #3 remodeled again by Whitney Brothers, with third floor added and a “mid-century moderne” facade. 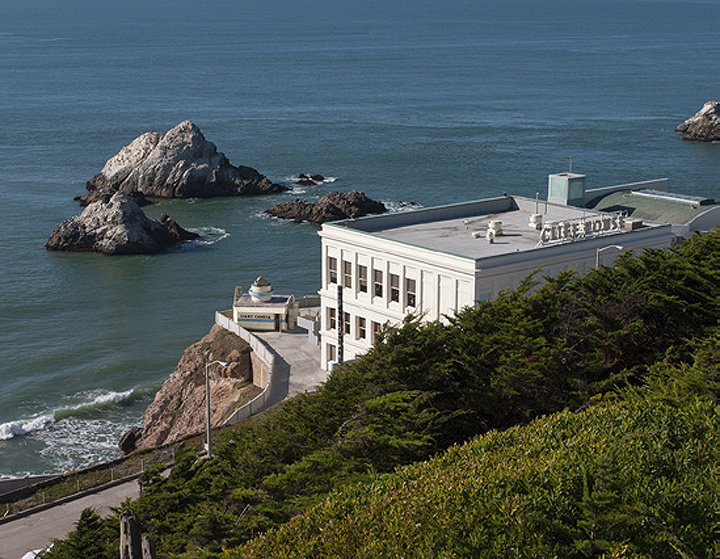 2004: Cliff House #3 rehabilitat­ed and exterior restored by National Park Service to approximate 1909 appearance. First, I checked with some architect friends. They agreed with my contention that additions and facade changes tacked onto a core structure do not turn it into a new building. Structures evolve over time as tenants continually adapt and remodel them, but unless completely torn down and replaced, it remains the same building. Second, there’s a logical conundrum here. If, as some claim, the 1909 structure was Cliff House #4, and the 1950 rebuild resulted in Cliff House #5, then what do we call the 2004 remodel that returned it to the 1909 appearance? Cliff House #6? Cliff House #4, Part II? Back to the Future? This is the type of debate that history nerds love to thrash out, preferably over a Steam Beer or an Irish Coffee at the Cliff House’s still cozy bistro bar. But in the end, it’s a kerfuffle in a teapot. 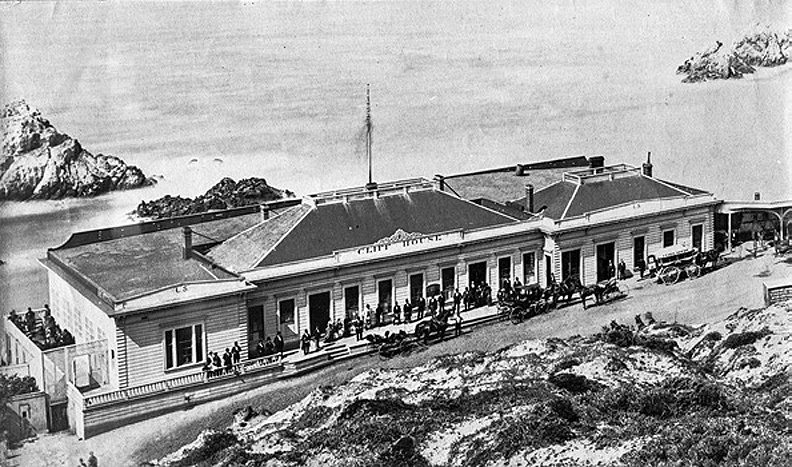 Architectural definitions and remodelings aside, for 155 years the Cliff House has served tourists and locals with a timeless view of an apparently endless ocean. See you there.